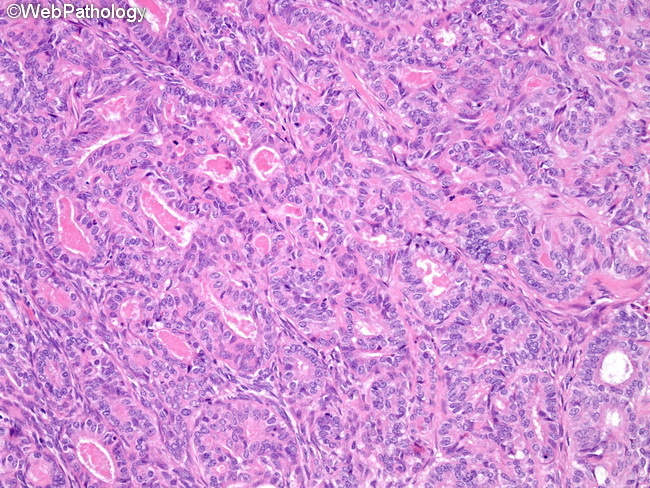 Differential Diagnosis of Monophasic Epithelial-predominant Synovial Sarcoma: It is extremely difficult to distinguish this rare subtype of synovial sarcoma (shown in this image) from adnexal tumors and metastatic carcinoma. A detailed clinical history and molecular genetic studies are helpful in arriving at the correct diagnosis. Poorly-differentiated Synovial Sarcoma: The differential diagnosis of poorly-differentiated synovial sarcoma includes other small round blue cell tumors, including Ewing family of tumors, neuroblastoma, rhabdomyosarcoma, mesenchymal chondrosarcoma, and lymphoma.